Where Has The Year Gone?! This Elmo cake was made for a little guy's 2nd Birthday. I had also made his 1st Birthday cake last year (Curious George) and can't believe a year has already gone by! The two-tiered cake had a square and round tier and is covered in fondant. This is a double layer 1/2 sheet cake. It is entirely edible and comes complete with a hand-painted hardwood floor (click on the picture for a larger image to see the floor detail). 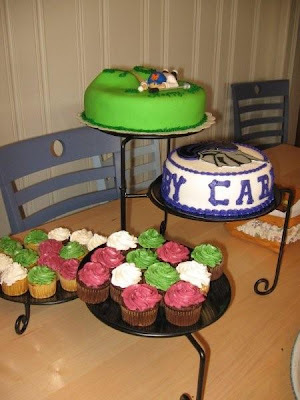 These cakes and cupcakes were made for a family celebration. We celebrated my uncle's 50th and my cousin's High School graduation. 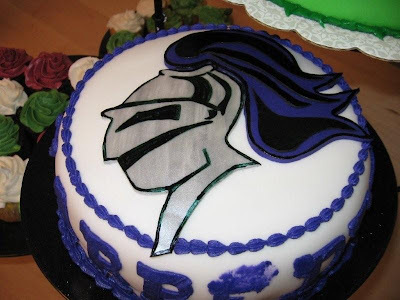 I made cupcakes in the colors of his middle school and high school colors and had the final cake- the Holy Cross cake on an upper tier. This cupcake stand can be rented from me- just ask! Hand cut and painted Holy Cross Mascot. 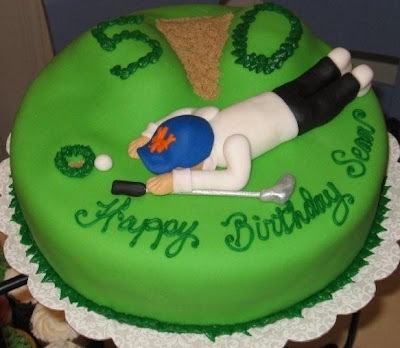 "Carpe Diem Bobby" was printed in a "varsity" font around the cake. This cake was made for my uncle's 50th Birthday. 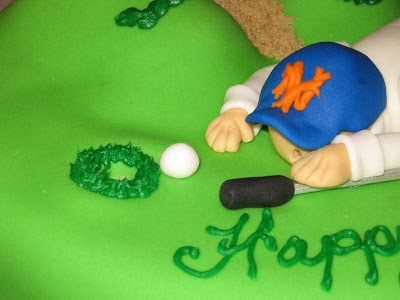 He loves golf and the Mets so we combined both favorites! red, blue, green, yellow, orange and purple! The "09" was hand-painted with edible shimmer dust.